When you start to think about selling your home, one of the first questions that will come to mind is “What’s my home worth?” While you can spend hours doing your own research and playing guessing games, the best way to find out how much your home is worth is to ask your Realtor®.The Patrick Stracuzzi Team knows the Florida real estate market well and can help you quickly determine how much your home is worth so that you can list at a price that will get your home sold. 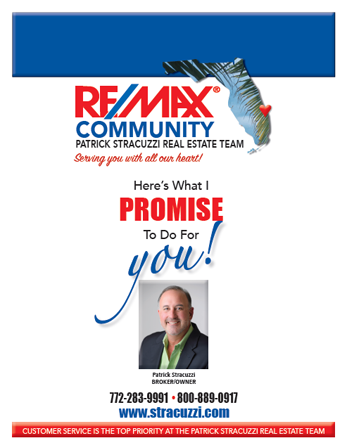 Not only will the Patrick Stracuzzi Team help you determine what your home is worth, but they will also help you prepare your home to sell, provide marketing support, set up showings, and negotiate and execute the best contract possible with the buyer. 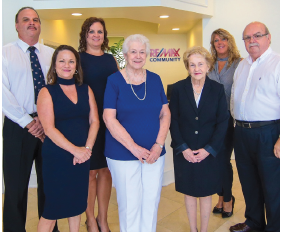 From initial contact to closing, our team will work hard to provide you with the confidence and security that you need to ensure a successful home sale. Our Director of First Impressions, Suzy Hofer, is ready to schedule showings on all calls coming into the office. Suzy will also provide you with feedback on those showings. Contact Suzy at 772-283-9991. Bonnie Haynes takes over this position on the weekends, to assure the phones are covered 24/7! To have a full-time Director of Operations, Jim Allin, means clients will see their homes in the MSL as soon as all information is gathered. Jim will call you to schedule the photography of your home. Jim also schedules my moving trucks, available to you FREE of charge when buying or selling a home with me. Contact Jim at 772-283-4112. Our Broker/Manager, Stacy Little, manages your contracts through closing. She regularly reviews contacts to be sure they are adhered to, and there’s always someone in the office to answer your call. Please call Stacy in reference to the Contract for Sale and Purchase, Inspection Reports, Addendums, Closing questions or anything that may be unclear. Contact Stacy at 772-283-1292. A full-time Director of Marketing, Presley Purpora, means the best possible exposure for your home and a strong commitment to the internet. Call Presley for any advertising questions that you may have 772-283-6343. Our Courier/Photographer, Tony Stracuzzi, is available to capture the true beauty of your home for all to see! Download our Pre Listing brochure from here before listing your home with us.